Zion Market Research has published a new report titled “Blockchain in Energy Market by Type (Public and Private), by Component (Platform and Services), by End-User (Power Sector and Oil and Gas Sector), and by Application (Grid Management, Energy Trading, Government Risk and Compliance Management, Payment Schemes, Supply Chain Management, and Others): Global Industry Perspective, Comprehensive Analysis, and Forecast, 2017-2024”. 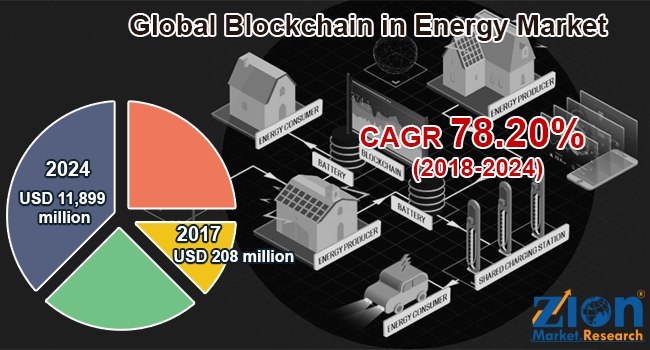 According to the report, the global blockchain in energy market was valued at around USD 208 million in 2017 and is expected to reach approximately USD 11,899 million by 2024, growing at a CAGR of above 78.20% between 2018 and 2024. Blockchain can be also termed as decentralized ledger technology. It has no core system or a central server. The authentication of these servers is handled publicly. It helps people to trade energy among themselves. The applications of blockchain in the energy market include payment schemes, grid management, governance risk and compliance management, energy trading, and supply chain management. The global blockchain in energy market is segmented based on type, component, application, and end-user. By type, this market is bifurcated into private and public. The component segment includes platform and services. The application of global blockchain in energy market includes grid management, energy trading, government risk and compliance management, payment schemes, supply chain management, and others. By end-user, this global market is divided into power and oil and gas sectors. In 2017, the power sector dominated the market and is expected to continue the trend over the forecast time period. This can be attributed to the rising demand for renewable energy around the globe.